This entry was posted on January 12, 2018 by B4S. The first modern business conference phone was first conceived by Polycom in 1992 [ see article ]and has morphed in the intervening 25 years to be the norm for any remote business meeting. They are aimed at delivering duplex ( two way ) conversation to large meeting rooms with multiple participants. Business is changing, and although we will always need a good, solid SoundStation type conference phone on hand for the big remote meeting, more and more we are seeing people work remotely who expect to be able to carry their office in their briefcase whilst remaining part of their enterprise cloud based business communications system. Hence the proliferation of Speakerphones released by major communications manufacturers recently. 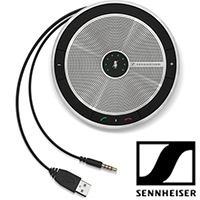 Senheisser's SP 20 Speakerphone is a truly portable and easy to use compact speakerphone. This is suitable for small to medium conferences/ meetings and delivers duplex - two way sound. easy to deploy, the SP20 can be set up in minutes and will work 'out of the box' with all major Unified Communications platforms. The SP20 has USB or 3.5mm jack for connection ( no Bluetooth ) and, as a nice touch, comes with a portable protection pouch. 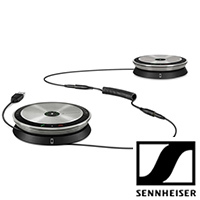 In what is both an intelligent pairing of hardware and a well conceived software build the Sennheiser SP220 takes two SP20's and links them up to create a mini system of speakerphones capable of providing clear, two way sound over a larger conferencing area taking advantage of Sennheiser's Voice Clarity and Advanced Signal Processing. This whole system is simple to set up and capable of allowing up to 12 people to take part in a remote conference. 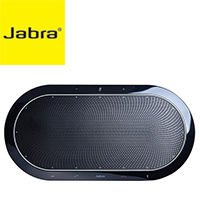 Jabra Speak 710 is a great speakerphone for the smaller group conference and has an impressive 15 hours of battery life. The HiFi grade speakers give a high quality sound whilst the microphone ( Omni Directional ) can pick up sound whilst minimising background noise in smaller meeting rooms. It can connect via both Bluetooth and USB. Compatible with major Unified Communications systems, the 710 requires no set up and works out of the box. The SFB ( Skype for Business ) version can also be programmed to integrate with Cortana, Siri, or Google Now. 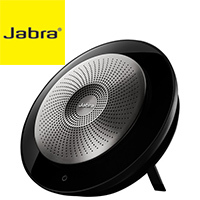 In the realm of speakerphones the Jabra Speak 810 is a step towards the range of the larger conference phone. It has enough range to fill a large meeting room with multiple participants. The microphones are powered by ZoomTalk which allows them to actively focus on the current speaker. Wideband Audio, HD Sound and DSP ( Digital Signal Processing ) combine to provide a truly stunning sound quality in such a compact device. Connection is provided via both Bluetooth and a 3.5mm jack. 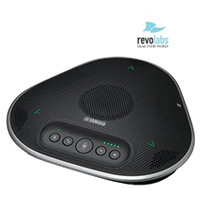 The Revolabs Yamaha YVC-300 Bluetooth Speakerphone is an ideal speakerphone for small conferencing situations. It supports NFC for quick and easy Bluetooth pairing. The Bluetooth connection also supports mobile and tablet connectivity. It does not require a power supply - pulling its power from a USB port from laptop or PC. Clear and distinct audio takes advantage of Yamaha's adaptive noise cancellation and background noise reduction. 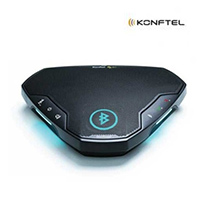 The Konftel Ego Bluetooth Speakerphone is a compact triangular desktop speakerphone which is fully compatible with Unified Communications platforms (SFB Compatible). 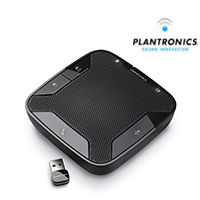 It has a range of connectivity options which includes Bluetooth, NFC and USB as well as a port for headset connection. The speakers are good enough quality for A2DP music steaming. The fully audio is controlled by Duplex Konftel's Omnisound Audio Technology. The price of this versatile speakerphone makes it worth considering. 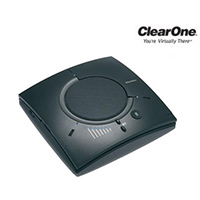 The ClearOne chat 160 is a high quality speakerphone designed for Skype. It can connect to PC / Mac or Laptop. It has 3 built in microphones to cover the entire 360° span around it. Each of these microphones can independently adjust their pick up sensitivity based upon participant volume providing a clearer sound with vastly reduced ambient background noise which is in turn enhanced by the ClearOne's integral Echo Cancellation. Plantronics may be better known for its business headsets but in keeping with the move to Unified Communications platforms it makes sense for Plantronics to add another type of endpoint into its portfolio. With the Calisto 620 Plantronics have come in with a low priced yet high quality speakerphone which delivers astounding quality. With 360° room coverage ( for a smaller meeting room ) it will provide full Duplex Wideband Audio with bi-directional microphones which activate to follow the current speaker. The Calitso 620 connects to a PC via USB and also has Bluetooth option to connect to tablet or mobile . It also supports A2DP streaming of high fidelity audio music.